Summary: We present the imaging and clinical findings of a case of recurrent cutaneous squamous cell carcinoma of the face in which CT and MR imaging revealed perineural tumor spread along the great auricular nerve. The great auricular nerve is a superficial cutaneous branch of the cervical plexus, providing sensory innervation to the skin of the parotid and periauricular region. Our purpose was to familiarize the reader with the anatomy of this nerve and imaging's potential role in the diagnosis of perineural tumor spread along this seldom seen structure. The great auricular nerve (GAN) is a superficial branch of the cervical plexus that provides sensory innervation to the skin overlying the parotid gland, external ear, and posterior auricular region. This nerve usually is not seen on routine imaging studies of the head and neck. The purpose of this article is to review the anatomy of the GAN and present a case in which this nerve could be seen on CT and MR images, secondary to its enlargement by perineural tumor spread (PNS). We are unaware of any previous reports documenting PNS involving the GAN in the literature. This case suggests that head and neck malignancies can spread in a perineural fashion along spinal, as well as cranial, nerves. The GAN is a superficial branch of the cervical plexus, contributed to by fibers from the C2 and C3 spinal nerves (1) (Fig 1). The cervical plexus is a complex structure formed by the ventral primary divisions of the first four cervical nerves (1). The plexus is anterolateral to the levator scapulae and medial scalene muscles and deep to the sternocleidomastoid muscle (1). The cervical plexus gives off multiple superficial cutaneous branches in addition to the GAN, including the lesser occipital nerve, which innervates the postauricular region, the transverse cutaneous nerve, which innervates the upper anterior neck, and the supraclavicular nerves (1) (Fig 1). There are also numerous muscular branches of the cervical plexus that innervate deep muscular structures of the neck (1). One such deep branch is the nervus descendens cervicalis or inferior root of the ansa cervicalis, which forms a loop in conjunction with the hypoglossal nerve and innervates the sternohyoid, sternothyroid, and inferior belly of the omohyoid muscles (1). Another well-known deep branch of the cervical plexus is the phrenic nerve (1). The GAN leaves the cervical plexus at the posterior border of the sternocleidomastoid muscle (Erb's point) and courses anteriorly over the lateral surface of this muscle. It then courses superiorly, dividing into anterior and posterior branches. The posterior branch supplies the skin over the mastoid process and lower external ear, and the anterior branch supplies the skin overlying the parotid gland and lower preauricular region. The GAN communicates with several cranial nerves in the following manner: the anterior branch sends a small twig (or several small twigs) into the substance of the parotid gland and connects to the facial nerve (1). The posterior branch communicates with the auricular branch of the vagus nerve and also with the posterior auricular branch of the facial nerve (1). To our knowledge, the GAN has not been described in the cross-sectional imaging literature; however, based on the anatomy, the expected course of the GAN would be deep to the sternocleidomastoid muscle for the more proximal aspect of the nerve. More distally, the GAN should be lateral to the sternocleidomastoid muscle, with diverging, superiorly oriented routes for the anterior and posterior branches. A 70-year-old man presented at our institution with an enlarging mass overlying the right parotid gland and an 8-month history of progressive right facial paralysis. Three years earlier, he had undergone resection of a poorly differentiated squamous cell carcinoma of the right cheek. A physical examination revealed a well-healed scar in the anterior cheek and a 3.5 × 4-cm mass overlying the inferior aspect of the right parotid gland, just above the mandibular angle. Extending inferiorly and posteriorly from this mass was an approximately 4-cm cord-like structure, which was firm, non-tender, and superficial to the right sternocleidomastoid muscle. Additional physical findings included a complete right facial paralysis and anesthesia over the mid- and lower parotid region, in the distribution of the anterior branch of the great auricular nerve. There was no cervical adenopathy. CT and MR imaging were performed. Both techniques revealed an irregular cutaneous and subcutaneous mass overlying the inferior aspect of the right parotid gland (Fig 2). 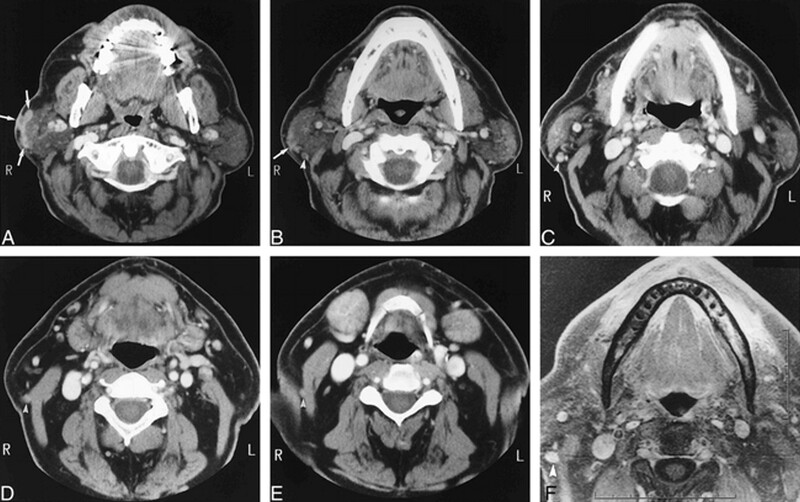 There was no radiologic evidence of deep tumor extension into the substance of the parotid gland or perineural spread along the main trunk of the facial nerve. Both MR imaging and CT showed an enhancing, cylindrical structure that extended inferiorly from the parotid gland, coursing along the lateral aspect of the sternocleidomastoid muscle, and corresponding to the cord-like lesion palpated clinically (Fig 2). This structure ended at the posterior border of the sternocleidomastoid muscle and was consistent with an enlarged anterior branch and distal main trunk of the great auricular nerve. No abnormal enhancement could be seen more proximally in the expected location of the cervical plexus or upper cervical spinal nerves. A–E, Axial contrast-enhanced CT scans, from superior to inferior. A, At level of parotid gland, cutaneous/subcutaneous tumor recurrence is indicated by enhancing mass (arrows). Note tumor is not extending into substance of parotid gland. B, Image caudal to A shows bottom of main tumor (arrow). Posterior to parotid gland is a round soft-tissue structure not clearly present on the other side, representing the enlarged upper anterior branch of the great auricular nerve (arrowhead). C, Image caudal to B shows GAN to be larger and clearly enhancing (arrowhead). D, Image caudal to C shows GAN along the lateral aspect of the sternocleidomastoid muscle (arrowhead). E, Image caudal to D shows GAN barely separable from lateral posterior aspect of sternocleidomastoid muscle (arrowhead). Below this level, the nerve could not be seen. 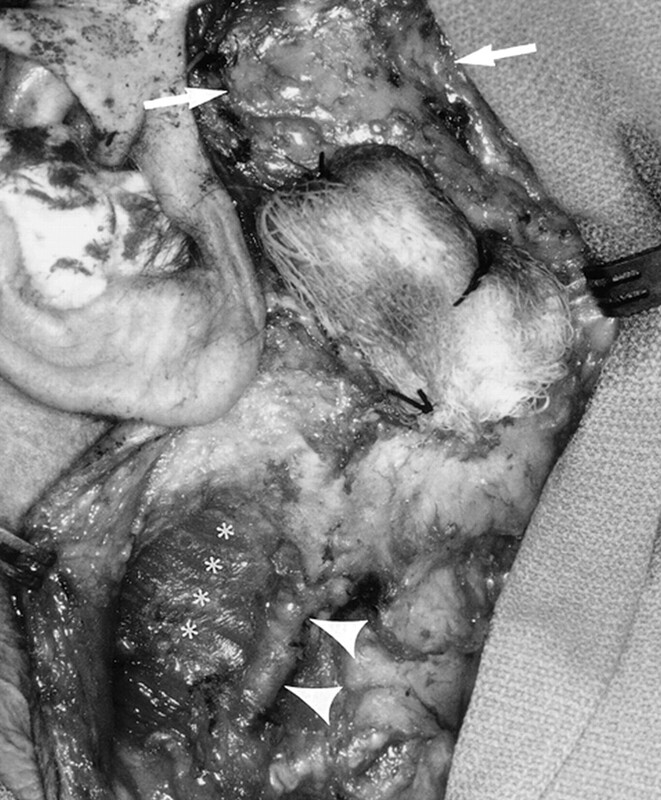 Surgery confirmed gross tumor involvement of the anterior branch and distal main trunk of the great auricular nerve (Fig 3). In addition, the tumor grossly involved the main intraparotid facial nerve, which necessitated a radical parotidectomy and ultimately partial mastoidectomy to obtain free neural margins. An upper neck dissection was performed as well, with resection of the GAN. Intraoperative photograph (anterior is shown on the right). A gauze pad is seen the overlying the tumor. The parotid gland (arrows) and sternocleidomastoid muscle (asterisks) are identified. The linear structure represents the anterior branch of the GAN (arrowheads). PNS in head and neck cancer is a well-described phenomenon, whereby tumor may extend a variable distance away from a primary tumor along the perineural sheath (2−7). PNS is an adverse prognostic indicator, one associated with decreased survival and, in many cases, alteration of therapy (6). Radiation fields might need to be expanded in the setting of perineural spread, and lesions that are thought to be resectable might be deemed unresectable. 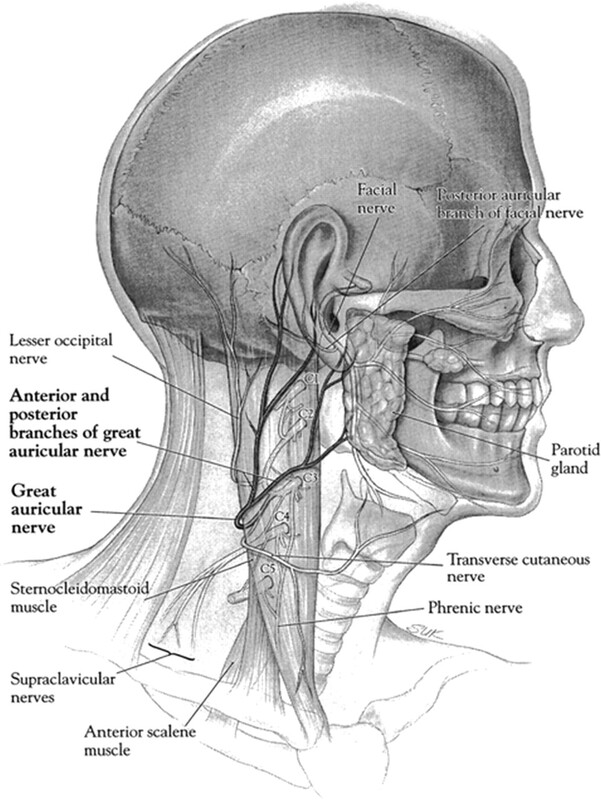 PNS generally involves branches of cranial nerves, principally the facial and trigeminal nerves (2). The lower facial region, however, derives cutaneous sensory innervation from nerves that are of spinal and not cranial origin. Our case illustrates that PNS may occur along these nerves as well. This has important implications for the radiologist. Because PNS may be asymptomatic, the radiologist must be vigilant to detect this spread before therapy. In the case presented, the cord-like nature of the lesion extending inferiorly from the main tumor mass alerted the clinician to the possibility of GAN PNS. Such a physical finding, however, may well be absent, and PNS along this nerve can be identified only if the radiologist is familiar with the regional anatomy. Because the GAN does not course through a neural foramen, as do most cranial nerve branches involved with PNS, the only expected imaging finding of PNS would be enlargement or abnormal enhancement of this nerve or both. Both of these findings were seen on our CT scans and MR images. Another interesting feature of this case was the facial nerve involvement that was apparent surgically and pathologically but was not revealed by imaging. At the time of surgery, there was no infiltration of tumor into the substance of the parotid gland. Therefore, it is presumed that the facial nerve involvement described herein occurred along the communicating branches between the GAN and the facial nerve. Alternatively, because the lesion was intimately associated with the parotid surface, tumor might have gained direct access to a peripheral intraparotid branch of the facial nerve. In any case, the absence of imaging findings of facial nerve PNS in this case is troubling and indicates that imaging is not 100% sensitive in the detection of this form of tumor spread. In cutaneous lesions of the head and neck, the potential exists for PNS along other branches of the cervical plexus, such as the lesser occipital or transverse cutaneous nerves. The potential also exists for retrograde PNS into the cervical plexus itself, with continued spread into either the main spinal nerve roots and neural foramina or antegrade PNS into other branches of the cervical plexus. In summary, this case demonstrates radiographically identifiable PNS along the great auricular nerve, a superficial branch of the cervical plexus. Because successful treatment requires identification of PNS before the institution of therapy, the radiologist should be familiar with the anatomy of the cervical plexus and its cutaneous branches, as well as with the potential for PNS along these nerves. We gratefully acknowledge the fine artwork of Ian Suk. ↵1 Address reprint requests to Lawrence E. Ginsberg, MD, Diagnostic Radiology, Box 57, The University of Texas M. D. Anderson Cancer Center, 1515 Holcombe Boulevard, Houston, TX 77030.